I just returned home from a few days in the Picos. 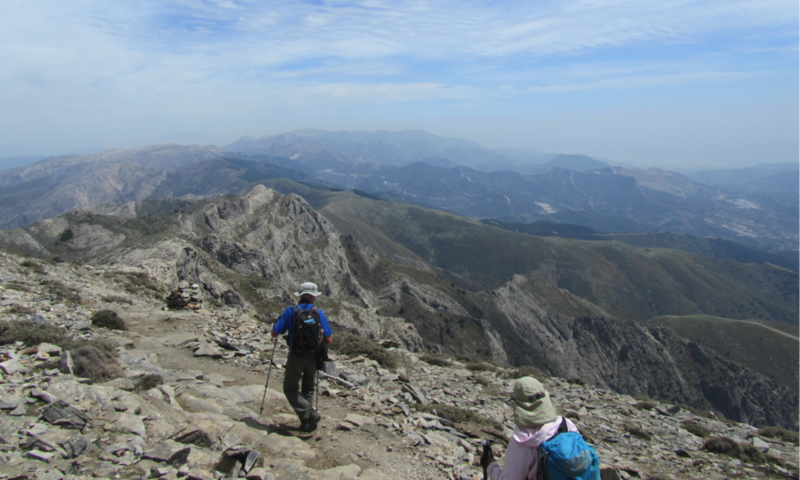 Temperatures in much of Spain reached well over 40 degrees (almost 47 in the shade in Granada) but, as always, the heat in the Picos was more temperate. Even so, we made an ascent of the Canal de Trea in almost 30 degrees, and in full sunshine. It was a brilliant but exhausting day. The refreshments, dinner and sleep at the Vega de Ario refuge were more than welcome. Following such a cold winter there was an unusual amount of snow on the ground at high levels, making some of the traverses difficult or impossible. The Atlantic weather systems make this area’s conditions unpredictable. But there is plenty of great walking without doing the most challenging routes in snow. I spent a few hours double-checking routes from my Picos de Europa book, because things can constantly change. I built a few new cairns on the route to Tresviso from Sotres, to make the vague path a little easier to find. And I went to Pandebano to look again at the route up to Pena Castil, where I met a strong Spanish walker descending at an early hour out of the mist. I guess he mustn’t have been able to sleep, to be coming down by 10 am!